Can I Afford to Prep? - Begin Prepping Now!! Many people I have talked to say that they can’t afford to prep. Everyone’s budget is stretched thin right now. That is actually evidence that it’s more important to prep now! Prepping can be a big ticket endeavor, but you can do it very economically too. I am not independently wealthy so I understand these concerns. Many prepper manuals are geared toward buying property and bunkers. I will assume that if you have the finances to do that, you have already started preparing. If you are looking at our current economic and political situation, or the recent weather phenomena, and feeling uneasy…DO SOMETHING NOW. Step 1: Commit to preparing. You need to shift gears in your mind… from consumer to prepper. Decide you will buy things that can be used now, or used in an emergency. Most people spend money on downloads. If you took all the money from downloads, and put it toward supplies, many people could have a fully stocked bug out bag built in a month. Step 2: Evaluate your home. Many people have things that would serve them well in an emergency, but they are buried in a garage full of crap. Or in a storage unit across town. Look at your home, and start preparing it for an emergency situation. Do you have nik-nacs that will become shrapnel in a bad storm? Do you keep medical supplies in one location so you could swoop it all into a bag and leave, if needed? Step 3: As you start readying your home you will find stuff to get rid of. If it’s garbage, recycle it or throw it away. If it’s serviceable, give it to a homeless shelter, battered women’s shelter, or vet organization. Find someone who can use it, and let them. Start unburying yourself. Think about a wildfire. If you had a day, before a wildfire hit your house, what could you save? Could you throw what you needed in your car, or would you be tripping over piles of “stuff”? I want you to really look at your home. Is it full of things you love and can use, or is generic stuff to impress others? Step 4: Sell it! As you find good things that you aren’t that attached to…sell them!!! 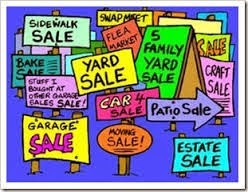 If you have enough, have a garage sale now. If you don’t have space, or it’s too cold right now, start listing it on the computer. List it on Craigslist, or Ebay, or Amazon. Ask your neighbors. Put it on a bulletin board at work. When you sell something, take the cash and go buy something you need to prepare. If you sell little stuff, either buy something small or save the cash in an envelope marked prep money. and decide what your next purchase is. You can do this. It doesn’t take much time. It won’ t cost much. The biggest thing is to change your thinking about what you need. A need is food , water , heat , shelter. Everything else is gravy. Well I am a minimalist and an old Eagle Scout. I love this site. When I was younger we were hit by Hurricane Alicia. Flooding and wind damage. That was a lesson. Great site and the topic is important. I have never experienced a hurricane, but have seen some horrible storms. I am sure being an eagle scout would help you deal with storms like that. Being a minimalist can be a good thing too, if you have the insight to have the truly needful things. I hope you keep checking back…always good to have like minded folks around to add ideas.